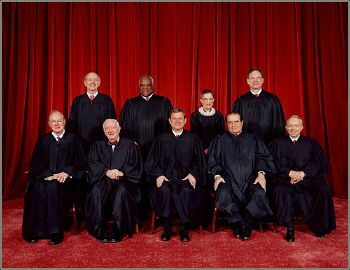 The justices of the Supreme Court of the United States in 2006. Top row (left to right): Stephen Breyer, Clarence Thomas, Ruth Bader Ginsburg, and Samuel A. Alito. Bottom row (left to right): Anthony Kennedy, John Paul Stevens, Chief Justice John G. Roberts, Antonin G. Scalia, and David H. Souter. 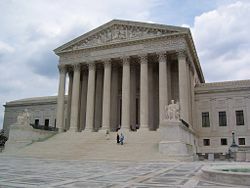 The Supreme Court of the United States (or the United States Supreme Court) is the highest judicial body in the United States and leads the judicial branch of the United States federal government. The court consists of nine justices: chief justice of the United States and eight associate justices of the Supreme Court of the United States. The justices are nominated by the president and confirmed with the "advice and consent" of the United States Senate. Appointed to serve for life, they can be removed only by resignation, or by impeachment and subsequent conviction. The Supreme Court holds both original and appellate jurisdiction, with its appellate jurisdiction accounting for most of the Court's caseload. The Court's original jurisdiction is narrowly focused, as defined in Article III, Section 2: "In all Cases affecting Ambassadors, other public Ministers and Consuls, and those in which a State shall be Party, the supreme Court shall have original Jurisdiction." The Court's appellate jurisdiction encompasses "all cases" within the scope of Article III, but is subject to limitation by acts of Congress under the Exceptions Clause in Article III and by the discretion of the Court. The independence of the Court is an important constitutional principle, enabling it to act as a check on the two other branches of government, the executive and the legislature. However, like other institutions the Supreme Court has overstepped the power vested in it by the Constitution by ruling on issues in a way that makes laws or rules on social issues originally left to the individual states. It has also played a role in increasing the power of the federal government and reducing individual state sovereignty. The US Supreme Court convened for the first time on February 2, 1790. The ratification of the United States Constitution established the Supreme Court in 1789. The court convened for the first time on February 2, 1790. The history of the Supreme Court is frequently described in terms of the chief justices who have presided over it. Initially, during the tenures of chief justices Jay, Rutledge, and Ellsworth (1789–1801), the Court lacked a home of its own and any real prestige. The Constitution was very general and the nature of the Court was still undefined in many ways. The Eleventh Amendment to the Constitution was passed by Congress in 1794 after one of the first major cases, Chisholm v. Georgia, in which a supplier of Revolutionary War goods sold to Georgia sought recompense in a civil suit. The Jay Court found in favor of the plaintiff. Congress overturned this case by passing the amendment which prohibits the Supreme Court from hearing cases where a citizen of one state brings a suit against another state, thus setting one limit on its jurisdiction. This changed forever during the John Marshall Court (1801–1835), which declared the Court to be the supreme arbiter of the Constitution (Marbury v. Madison), and made a number of important rulings which gave shape and substance to the Constitutional balance of power between the federal government (referred to at the time as the "general" government) and the states. Martin v. Hunter's Lessee showed the limits of that federal power—although the U.S. High Court declared itself supreme over the Virginia state court—it had a difficult time enforcing its judgment in a hostile state. The Marshall Court ended the practice of each judge issuing his opinion seriatim, a remnant of British tradition, and instead one majority opinion of the Court was issued. The Marshall Court also saw Congress impeach a sitting justice, Samuel Chase, who was acquitted. This impeachment was one piece of the power struggle between the Jeffersonians and the Federalists after the election of 1800 and the subsequent change in power. The failure to remove Chase is thought to signal the recognition by Congress of judicial independence. The Roger B. Taney Court (1836–1864) made a number of important rulings, such as Sheldon v. Sill, which held that while Congress may not limit the subjects the Supreme Court may hear, the Constitution does not so restrain it where lower courts are concerned. However, it is primarily remembered for its ruling in Dred Scott v. Sandford, the case which may have helped precipitate the United States Civil War. This court was accused of being pro-slavery by ruling that Scott, an escaped slave living freely in a non-slave state more than seven years, was still property of the slave holder, and in addition, it declared that a law forbidding slavery in new territories was unconstitutional. The decision split the Republicans (anti-slavery) and the Democrats (pro-slavery). It was intolerable to the conscience of those who believed in the declaration that "all men were created equal," but it had upheld the original constitutional principle of state sovereignty by declaring federal laws on such matters unconstitutional. After the Civil War, Congress passed the civil war amendments (the thirteenth, fourteenth and fifteenth) to the Constitution to give the federal government the power to enforce an end to slavery. In the years following the Civil War, the Salmon P. Chase, Morrison Waite, and Melville Fuller courts (1864–1910) interpreted the new amendments, particularly the Fourteenth Amendment, which opened the door for decisions on social issues not related to slavery in which Supreme Court decisions would trump individual state laws. In addition, the Fourteenth Amendment, which was passed to ensure blacks equal protection and due process under the law, was used as the basis to declare corporations as "persons" requiring "equal protection" under the laws in Santa Clara County v. Southern Pacific Railroad Company (1886). The doctrine of substantive due process was developed in Lochner v. New York (1905) and Adair v. United States (1908). Substantive due process is a doctrine that allows the federal court to demand state conformity to federal laws with respect to substantial items like private property. The later case declared the Erdman Act, which gave workers protection from corporations if they were union members, unconstitutional. This further freed corporations from state interference in their business, and some changes that may have protected corporations more than individual citizens. Expansion of corporate rights continued with Allgeyer v. Louisiana (1897) but began to reach initial limits when the Court recognized state sovereignty in Holden v. Hardy (1898) and Muller v. Oregon (1908). The ruling in favor of segregation in Plessy v. Ferguson (1896) has frequently been cited as evidence racism continued in the Supreme Court throughout the nineteenth century. Under the Edward Douglass White and William Howard Taft courts (1910–1930), before the Great Depression, the substantive due process doctrine reached its first apogee (Adkins v. Children's Hospital), and the Court held that the Fourteenth Amendment applied some provisions of the Bill of Rights to the states (Gitlow v. New York). During the Charles Evans Hughes, Harlan Fiske Stone, and Fred M. Vinson courts (1930–1953), the court radically changed its interpretation of the Constitution in order to facilitate the New Deal (West Coast Hotel Co. v. Parrish), giving an expansive reading to the powers of the federal government. The Earl Warren Court (1953–1969) made a number of alternately celebrated and controversial rulings expanding the application of the Constitution to civil liberties, leading a renaissance in substantive due process. It held that segregation was unconstitutional in Brown v. Board of Education (overturning the decision of Plessy v. Ferguson), that the Constitution protects a general right to privacy (Griswold v. Connecticut), that schools cannot have official prayer (Engel v. Vitale) or mandatory Bible readings (Abington School District v. Schempp), dramatically increased the scope of the doctrine of incorporation (Mapp v. Ohio; Miranda v. Arizona), read an equal protection clause into the Fifth Amendment (Bolling v. Sharpe), held that the states may not apportion a chamber of their legislatures in the manner in which the United States Senate is apportioned (Reynolds v. Sims), and held that the Constitution requires active compliance (Gideon v. Wainwright). Chief Justice Warren baldly stated, "We make the law," willing overstepping the slow process of Congress, in the troubled depression years. The Warren E. Burger Court (1969–1986) ruled that abortion was a constitutional right (Roe v. Wade), reached muddled and controversial rulings on affirmative action (Regents of the University of California v. Bakke) and campaign finance regulation (Buckley v. Valeo), and that the death penalty was unconstitutional (Furman v. Georgia) and then later that it was not unconstitutional (Gregg v. Georgia). The groundwork for the Supreme Court to make federal decisions on moral issues can be traced from the Fourteenth Amendment, through the doctrines of due process of law and substantive due process, to the greater role played by the Court in the Depression. By the 1970s many Americans expected, or requested, the Supreme Court to decide on cultural issues which the founders had completely left to the individual states. However, in issues of social policy one Court has frequently reinterpreted or overturned rulings of earlier courts and, as in the cases of slavery and abortion often contributed to cultural division as it legitimated the position of one major group and outlawed the position of another. The William Rehnquist Court (1986–2005) narrowed the focus of the private right of action, the right of labor unions to picket (Lechmere Inc. v. NLRB) and of Roe v. Wade (Planned Parenthood v. Casey) but dramatically circumscribed the ability of states to regulate abortion (Stenberg v. Carhart), gave sweeping meaning to ERISA pre-emption (Shaw v. Delta Air Lines, Inc., Egelhoff v. Egelhoff) thereby denying plaintiffs access to state court with the consequence of limiting compensation for tort like harm to medical patients covered by employer plans to very circumscribed remedies (Aetna Health Inc. v. Davila, CIGNA Healthcare of Texas Inc. v. Calad) and began an instauration of federalism, limiting the scope of Congressional power under the Commerce Clause (United States v. Lopez; United States v. Morrison). The John Roberts Court began with the confirmation and swearing in of John Roberts on September 29, 2005. It is generally regarded as more conservative than the William Rehnquist Court. The United States Constitution did not specify the size of the Supreme Court; but instructed Congress to fix the number of justices. Originally, it was set at six by the Judiciary Act of 1789. As the country grew geographically, the number of justices steadily increased to correspond with the growing number of judicial circuits. The court was expanded to seven members in 1807, nine in 1837 and ten in 1863. In 1866, Congress wished to deny President Andrew Johnson any Supreme Court appointments and passed the Judicial Circuits Act, which provided that the next three Justices to retire would not be replaced; thus, the size of the Court was to eventually reach seven through attrition. One seat was removed in 1866 and a second in 1867, but the Circuit Judges Act of 1869 fixed the number of justices at nine (the chief justice and eight associate justices), where it has remained ever since. President Franklin Delano Roosevelt attempted to expand the Court, planning to appoint one new, additional justice for every justice who reached the age of seventy but did not retire from the bench, until the Court reached a maximum size of fifteen justices. Ostensibly, this was to ease the burdens of the docket on the elderly judges, but it was widely believed that the president's actual purpose was to add justices who would favor more of his New Deal policies, which had been regularly ruled unconstitutional by the Court. This plan, referred to as the "Court Packing Plan," failed in Congress. The Court, however, moved from opposition to Roosevelt's New Deal programs to support, rendering the president's effort moot. In any case, Roosevelt's long tenure in the White House allowed him to appoint eight justices to the Supreme Court and promote one associate justice to chief justice. Article II of the United States Constitution provides the power to appoint justices to the president of the United States (acting with the "advice and consent" of the Senate). There are no qualifications listed in the Constitution regarding prior legal or judicial experience, nor are there any exclusions of foreign-born nominees. Presidents usually have nominated individuals who broadly share their ideological views. However, nominees whose views are perceived as extreme may be blocked by the Senate. In many cases, justices' decisions have been contrary to what the president anticipated. A famous instance was conservative President Eisenhower's nomination of Chief Justice Earl Warren, who grew quite liberal. Eisenhower later called the appointment "the biggest damn fool mistake I ever made." The confirmation process often attracts considerable attention from special-interest groups, many of which lobby senators to confirm or to reject. The Senate Judiciary Committee conducts hearings, questioning nominees to determine their suitability. Thereafter, the whole Senate considers the nomination; a simple majority vote is required to confirm or to reject a nominee. Rejections are relatively uncommon; the Senate has explicitly rejected only twelve Supreme Court nominees in its history. The most recent rejection of a nominee by vote of the full Senate came in 1987, when the Senate refused to confirm Robert Bork. In 1991, Clarence Thomas's nomination was hampered by allegations of sexual harassment, but the Senate eventually confirmed him by a vote of 52-48. Not everyone nominated by the president has received a floor vote in the Senate. For example, a nominee may be filibustered. A filibuster indefinitely prolongs debate thereby preventing a final vote on the nominee. It is also possible for the president to withdraw a nominee's name at any time before the actual confirmation vote occurs. This usually happens when the president feels that the nominee has little chance of being confirmed. For example, President George W. Bush granted a request by Harriet Miers to withdraw her 2005 nomination before a committee hearing had been scheduled, citing her concerns about Senate requests for access to internal White House documents during the confirmation process. In 1987, President Ronald Reagan withdrew the name of Douglas H. Ginsburg soon after the announcement of his nomination because allegations he had used marijuana. While senators may filibuster a Supreme Court nominee in an attempt to thwart confirmation, no new appointment has been successfully filibustered, however President Lyndon B. Johnson’s nomination of sitting associate justice Abe Fortas to succeed Earl Warren as chief justice was successfully filibustered in 1968. Until the 1980s, the approval process of justices was frequently quick. From the Truman through Nixon administrations, justices were typically approved within one month. From the Reagan administration on, the process has taken longer and been more politicized. When the Senate is in recess, the president may make a temporary appointment without the Senate's advice and consent. Such a recess appointee to the Supreme Court holds office only until the end of the next Senate session (at most, less than two years). To continue to serve thereafter and be compensated for his or her service, the nominee must be confirmed by the Senate. Of the two chief justices and six associate justices who have received recess appointments, only Chief Justice John Rutledge was not subsequently confirmed for a full term. No president since Dwight D. Eisenhower has made a recess appointment to the Supreme Court, and the practice has become generally frowned upon, even when applied to lower federal courts. The Constitution provides that justices "shall hold their Offices during good Behavior" (unless appointed during a Senate recess). The term "good behavior" is interpreted to mean life tenure. However, justices may resign, retire, or be removed by impeachment and conviction by congressional vote (the last has never occurred). On average, a vacancy arises every two years; however, long stretches without any vacancies occur from time to time. For instance, no vacancy arose for the eleven years between Stephen Breyer's appointment in 1994 and Chief Justice William Rehnquist's death in 2005. The Court's yearly terms usually start on the first Monday in October and finish sometime during the following June or July. Each term consists of alternating two week intervals. During the first interval, the court is in session ('sitting') and hears cases, and during the second interval, the court is recessed to consider and write opinions on cases they have heard. The circuit assignments frequently, but do not always and need not, reflect the geographic regions where the assigned justices served as judges or practitioners before joining the Supreme Court. The chief justice is usually assigned to the District of Columbia Circuit, the Federal Circuit and the Fourth Circuit (which surrounds the District of Columbia); each associate justice is assigned to one or two judicial circuits. TThe court is currently filled with nine justices. Among the current members of the Court, Clarence Thomas is the longest-serving justice; the most recent justice to join the court is Brett Kavanaugh, whose tenure began October 6, 2018. There are currently four living retired justices of the Supreme Court of the United States: John Paul Stevens, Sandra Day O'Connor, Anthony Kennedy, and David Souter. As retired justices, they no longer participate in the work of the Supreme Court, but may be designated for temporary assignments to sit on lower federal courts, usually the United States Courts of Appeals. Such assignments are formally made by the Chief Justice, on request of the chief judge of the lower court and with the consent of the retired justice. Research suggests that justices are often strategic in their decisions to leave the bench with personal, institutional, and partisan factors playing a role. The fear of mental decline and death often precludes justices from stepping down. The desire to maximize the Court's strength and legitimacy through one retirement at a time when the Court is in recess and during non-presidential election years suggests a concern for institutional health. Finally, if at all possible, justices seek to depart with a philosophically compatible president holding office to ensure that a like-minded successor will be appointed. The Supreme Court occupied various spaces in the United States Capitol until 1935, when it moved into its own purpose-built home at One First Street Northeast, Washington, D.C. The four-story building was designed in a classical style sympathetic to the surrounding buildings of the U.S. Capitol complex and Library of Congress by architect Cass Gilbert, and is clad in marble quarried chiefly in Vermont. The building includes space for the courtroom, justices' chambers, an extensive law library, various meeting spaces, and auxiliary services such as workshop, stores, cafeteria and a gymnasium. The Supreme Court building is within the ambit of the Architect of the Capitol, but maintains its own police force, separate from the Capitol Police. Independence of the Court is sometimes disputed, when decisions of the court appear to have a party-political bias. In November 2000, when the Court ruled against the recount of votes in the presidential election in Florida, it was perceived as biased in favor of George W. Bush as opposed to the losing Democratic candidate, Al Gore, since the majority of justices had been appointed by Bush's father. The jurisdiction of the federal courts was further limited by the Eleventh Amendment to the United States Constitution, which forbade the federal courts from hearing cases "commenced or prosecuted against [a State] by Citizens of another State, or by Citizens or Subjects of any Foreign State." However, the Eleventh Amendment is not deemed to apply if a state consents to be sued. Moreover, the Supreme Court has ruled that Congress may abrogate the states' immunity from lawsuits in certain circumstances. In addition to constitutional constraints, the jurisdiction of the federal courts is also limited by various federal laws. For example, the federal courts may consider "Controversies ... between Citizens of different States" only if the amount in controversy exceeds $75,000; otherwise, the case may only be brought in state courts. The power of the Supreme Court to consider appeals from state courts, rather than just federal courts, was created by the Judiciary Act of 1789 and upheld early in the Court's history, by its rulings in Martin v. Hunter's Lessee (1816) and Cohens v. Virginia (1821). The Supreme Court is the only federal court that has jurisdiction over direct appeals from state court decisions, although there are a variety of devices that permit so-called "collateral review" of state cases. Congress controls the Court's appellate jurisdiction. The basic statutes effective in conferring and controlling jurisdiction of the Supreme Court may be found in 28 U.S.C. 1251, 1253, 1254, 1257-1259, and in various special statutes. The Supreme Court is not required to hear every case presented to it. In cases that are heard by a three-judge United States district court (a practice that formerly was somewhat common but has been limited to very few cases by legislation in recent years), there is a right of appeal directly to the Supreme Court, although the Court may dispose of these appeals by summary judgement if it does not believe they are important enough for full briefing and argument. In most instances, however, the party must petition the Supreme Court for a writ of certiorari. By custom, certiorari is granted on the vote of four of the nine Justices. In most cases, the writ is denied; the Supreme Court normally only considers matters of national or constitutional importance. If the Court refuses to grant certiorari, it does not comment on the merits of the case; the decision of the lower court stands unchanged as if Supreme Court review had not been requested. Supreme Court decisions are typically cited as in the following example: "Roe v. Wade, 410 U.S. 113 (1973)." The citation consists of the names of the opposing parties; the volume number; "U.S." (signifying United States Reports, the official reporter of Supreme Court decisions); the page number on which the decision begins; and the year in which the case was decided. The names of the opposing parties are listed in the format "Petitioner v. Respondent" or "Appellant v. Appellee." The Reporter of Decisions is responsible for publication of the Court's rulings. There are two other widely-used reporters: the Supreme Court Reporter and the Lawyer's Edition, corresponding to two privately-published collections of decisions. A constitution is, in fact, and must be regarded by the judges, as a fundamental law. It therefore belongs to them to ascertain its meaning, as well as the meaning of any particular act proceeding from the legislative body. If there should happen to be an irreconcilable variance between the two, that which has the superior obligation and validity ought, of course, to be preferred; or, in other words, the Constitution ought to be preferred to the statute. The Supreme Court first established its power to declare laws unconstitutional in Marbury v. Madison (1803), consummating the system of checks and balances. The Supreme Court cannot directly enforce its rulings; instead, it relies on respect for the Constitution and for the law for adherence to its judgments. One notable instance of non-acquiescence came in 1832, when the state of Georgia ignored the Supreme Court's decision in Worcester v. Georgia. President Andrew Jackson, who sided with the Georgia courts, is supposed to have remarked, "John Marshall has made his decision; now let him enforce it! "; however, this quotation is likely apocryphal. State militia in the South also resisted the desegregation of public schools after the 1954 judgment Brown v. Board of Education. More recently, many feared that President Richard Nixon would refuse to comply with the Court's order in United States v. Nixon (1974) to surrender the Watergate tapes. Nixon, however, ultimately complied with the Supreme Court's ruling. Throughout its history, the Supreme Court has had the task of balancing the intentions of the founders and the Constitution with the changing realities of United States history. In that process, it has contributed to the expanded power of the federal government with respect to individual states and the expanded power of economic corporations (now legal "persons") and other special interest groups. The power of individual citizens and individual states has become relatively less over time. However, the rights of individuals, states, corporations and the federal government will continually have to be balanced as all are integral to the peaceful functioning of the United States. The Supreme Court will continue to play a major role, not only in being a branch balanced against others, but in balancing the rights and interests of all these important segments of society. ↑ The only justice ever impeached, Samuel Chase, was acquitted by the Senate (that is, was not removed from office). ↑ Thom Hartman, Unequal Protection: The Rise of Corporate Dominance and the Theft of Human Rights (Allentown, PA: Rodale Press, 2002, ISBN 1579546277). ↑ Charles H. Sheldon, The Supreme Court: Politicians in Robes (London: Glenco Press, 1970), p. xxi. ↑ Linda Greenhouse, In Steps Big and Small, Supreme Court Moved Right The New York Times, July 1, 2007. Retrieved September 21, 2018. ↑ Todd S. Purdum, “Presidents, Picking Justices, Can Have Backfires” The New York Times, July 5, 2005. Retrieved September 21, 2018. ↑ FindLaw, FindLaw Supreme Court Center: History. Retrieved September 21, 2018. Biskupic, Joan, and Elder Witt. Congressional Quarterly’s Guide to the U.S. Supreme Court. Washington, DC: Congressional Quarterly Press, 1997. Harvard Law Review Assn. The Bluebook: A Uniform System of Citation, 17th ed. 2000. Martin v. Texas, 200 U.S. 316, 26 S.Ct. 338, 50 L.Ed. 497. 1906. The Rules of the Supreme Court of the United States (2005 ed.). Retrieved October 9, 2018. Sheldon, Charles H. The Supreme Court: Politicians in Robes. London: Glenco Press, 1970. Snowden v. Hughes, 321 U.S. 1, 64 S.Ct. 397, 88 L.Ed. 497. 1944. Warren, Charles. The Supreme Court in United States History, 3 vols. Boston: Little, Brown and Co., 1924. All links retrieved September 21, 2018. History of "Supreme Court of the United States"